In ancient times, warriors would gather before epic battles to plan their attacks. Before one such battle, the warriors’ estimate for survival was 32.33% (repeating of course). Even though that was better than their usual outcome, they were still frozen with fear. That’s when the mythical hero Leeroy charged the frontlines. He shouted his own name with such vigor that other warriors were inspired to follow him into battle as he led the charge for an epic victory! 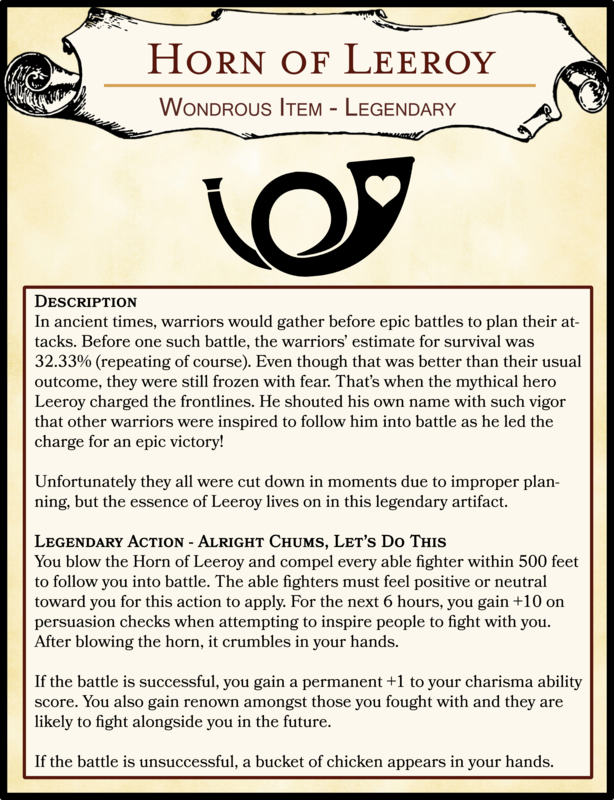 Unfortunately they all were cut down in moments due to improper planning, but the essence of Leeroy lives on in this legendary artifact. You blow the Horn of Leeroy and compel every able fighter within 500 feet to follow you into battle. The able fighters must feel positive or neutral toward you for this action to apply. For the next 6 hours, you gain +10 on persuasion checks when attempting to inspire people to fight with you. After blowing the horn, it crumbles in your hands. If the battle is successful, you gain a permanent +1 to your charisma ability score. You also gain renown amongst those you fought with and they are likely to fight alongside you in the future. If the battle is unsuccessful, a bucket of chicken appears in your hands.